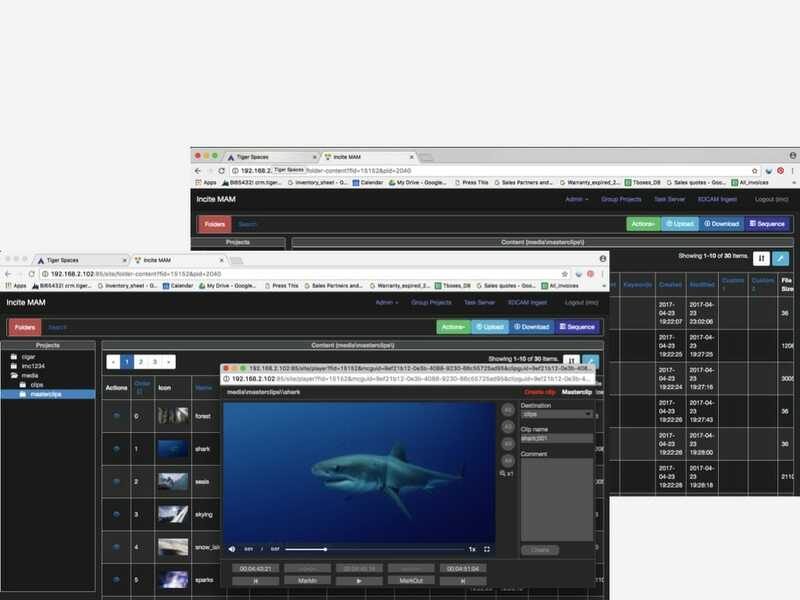 Tiger Spaces|MAM is an optional Media Asset Management module designed by IMC Technologies. It further enhances efficiency of Rich Media & Entertainment workflows by complementing Tiger Spaces with a robust engine for cataloging, searching, making clip selection and building a rough cut-list that can be imported directly into Avid Media Composer, Adobe Premiere or Apple Final Cut Pro. Tiger Spaces|MAM is the result of unique partnership between Tiger Technology and IMC Technologies aiming at integrating Incite MAM functionality into Tiger Spaces. As a result, Tiger Spaces|MAM offers users a fully transparent and efficient workflow capable of handling millions of assets. User management and workspace creation is handled by Tiger Spaces. Tiger Spaces|MAM inherits user permissions as well as workspace attributes. When the Tiger Spaces|MAM module is installed, the Tiger Spaces search functionality is enhanced and returns results from the MAM. With a field-proven engine capable of handling hundreds of terabytes of data with millions of clips, Tiger Spaces|MAM is able to undertake serious jobs. Once material has been catalogued using time codes, comments and keywords, any number of editors, producers, and even clients can access your database remotely. Tiger Spaces|MAM automatically creates low-bandwidth H.264 proxies that can then be accessed from any web browser. Material can then be accessed from any location using an intuitive and easy to use HTML5 browser. Tiger Spaces|MAM makes it easy for everyone to search keywords (based on what they can access); make their preferred shot selection; mark in and out points; and preview a frame-accurate cut list. Once a cut-list is prepared, you can easily export it as a standard EDL that can be taken into most editing package, such as Adobe Premiere, Apple Final Cut Pro, Avid Media Composer, etc. When your workflow calls for advanced MAM functionality and/or custom development, you can upgrade to IMC Technologies' Incite MAM. Since the databases are fully compatible, your upgrade process will be very smooth. By allowing users to catalog, make clip selection and comment remotely on their material, Tiger Spaces|MAM facilitates collaboration and finding. Figure 1 shows that Tiger Spaces|MAM can be connected to the worldwide web so users can access the MAM module from anywhere. Please refer to Tiger Space's System Requirements.